Packed with vitamins, nutrients, and antioxidants, this patch is designed to help counteract alcohol’s effects on your body. Drinking takes certain nutrients away, but this patch replenishes them with a bloodstream-direct delivery. Place it on your skin 45 minutes before your first sip, and leave it on until eight hours after your last one. Dimensions (each): 3" x 3"
I purchased this for my young nieces and nephews. They loved it. And they felt better the morning after! Having a few drinks with friends can be fun—and exhausting, especially the next morning. 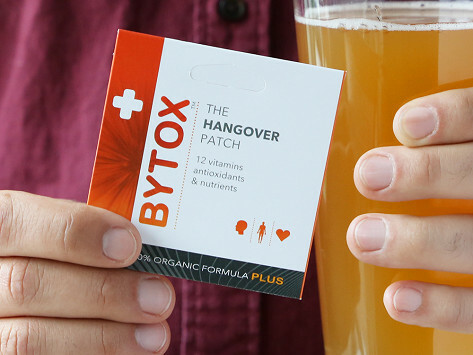 This American made patch is packed with nutrients, vitamins, and antioxidants, specifically chosen to diminish certain adverse effects of alcohol. The result is that it can help reduce hangover symptoms. That beer or glass of wine depletes your body’s vitamin B complex, which impacts your central nervous system and can leave you tired, with a headache, or feeling less like yourself. Made in the USA, Bytox goes directly on your skin, delivering nutrients directly to your bloodstream to help restore your body’s natural balance. Apply the patch to a dry, hairless part of the body about 45 minutes before drinking and leave it on for at least eight hours after you’ve had your last sip. All the while, make sure you stay hydrated. Remember, always drink responsibly and avoid overdoing it. 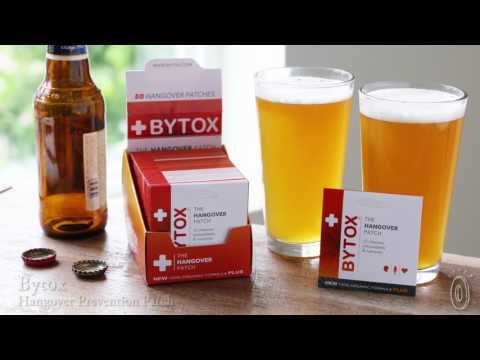 But if a drink (or a few) leads to feeling sluggish the next day, stick on a Bytox and patch up your hangover-fighting game.